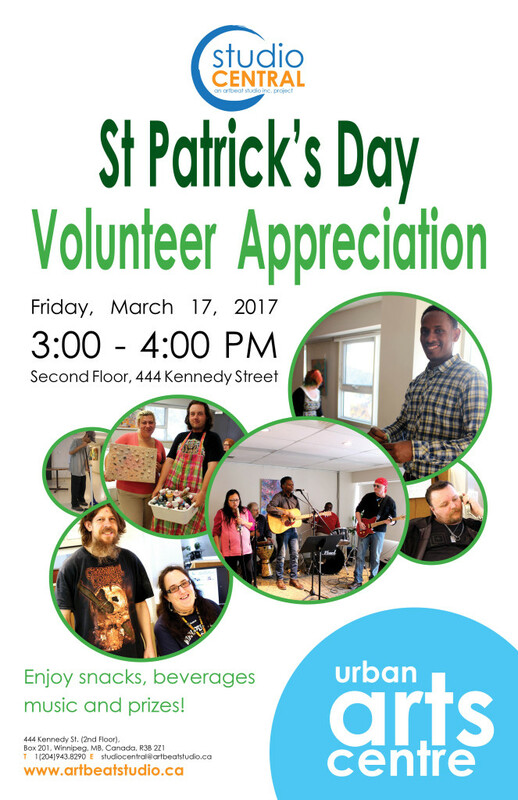 Artbeat Studio warmly invites you to a Volunteer Appreciation event next Friday, March 17th from 3:00 to 4:00 at Studio Central. At the heart of Artbeat Studio are it’s volunteers. We want to say thank you for giving your time and skill so generously. Let’s celebrate the gifts you bring! Please join us for an afternoon of celebration including live music, treats and volunteer recognition. Irish fiddle music by Ameena Bajer-Koulack and Quintin Bart. Please RSVP by email or by phone, (204) 943-8290, by Wednesday March 15th. This is a come and go event. Come and celebrate with us!